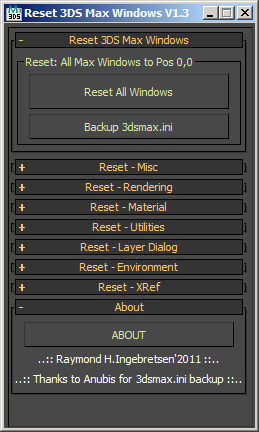 Reset 3DS Max Windows V1.3 – Reset All 3DS Max “floating” Windows to position 0,0 upper left when they are gone or out of range. Use & modify at you own risk. 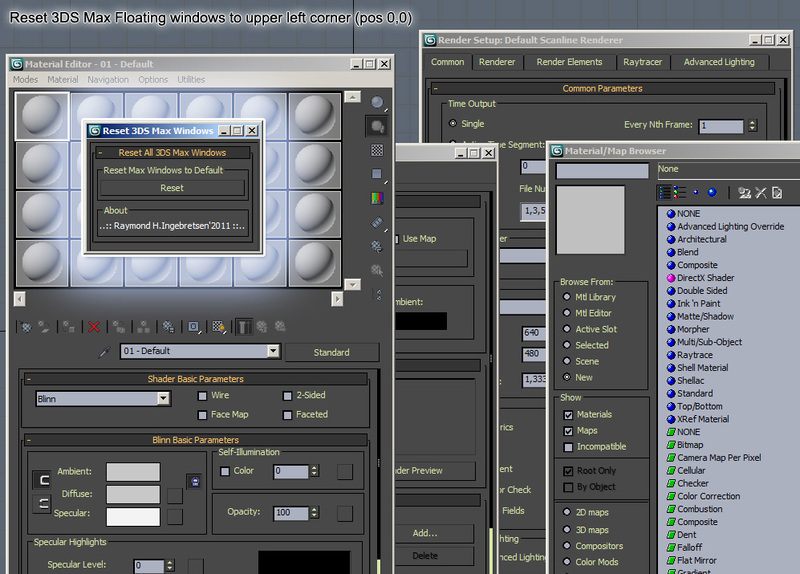 V1.1: Added more 3DS Max Floater windows. V1.2: Added support to reset invidually. Submitted by jgk1981 on Thu, 2016-08-11 07:07. Is it possible to Reset custom toolbars? For example when the toolbar was on another monitor and now working with one monitor the toolbar position is still exist on the position it was with the second monitor. can you bring the floating toolbar to the center? Submitted by otmorozen on Wed, 2016-08-10 11:43. Thank you for you script! Can you please add function for reset "isolate selection" floater. And for resetting floating toolbars if it possible. Submitted by jewoneone on Thu, 2013-04-25 23:44. Submitted by stealthx on Wed, 2011-10-12 05:50. Submitted by carlesimo on Tue, 2011-09-20 12:24. Submitted by evilmpire on Thu, 2011-08-25 13:38. Submitted by Dariusz on Wed, 2011-06-15 10:23. BIG. HUGE. ENORMOUS... favor plox. Can u make settings to set up on other display than 0.0 ? I have dell 1920x1200 and Centiq 1600x1200 and I use max only on Centiq, Its such a pain when icons keep ALL the time reseted on other screenn... Can u plz make option to set new default icon positions on second screen plz ? Submitted by othoap on Wed, 2011-06-08 09:20. This is my number one max UI compliant. It's as if the rollout's know exactly where your working and place the window right on top of your work. If I had my way there would be NO floating rollouts. Rollouts would open in the "Control Panel"
Submitted by MarkD on Wed, 2011-06-08 09:02. I was mostly thinking of positioning a window where you want it and by clicking a button, set its new default position. This isn't so much an issue with max's windows like the material editor, but more with scripts and various plug-ins that always pop open a window in the dead center. So for example every time you launch 5 or 6 scripts and they all pop up in the center and each time you have to arrange all the windows. It would be awesome if there was a way to set the default position for each one. Submitted by tassel on Thu, 2011-06-02 08:04. What do you mean by "set current position as default" ? You want the 3ds max current positions when you installed 3dsmax to be the current positions? 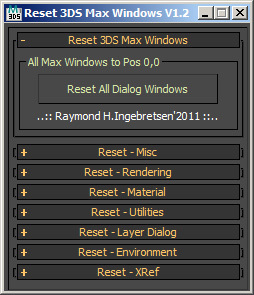 You want to take a backup of you window positions, so these can be restored when 3dsmax.ini screws up? Anyway, all off you: feel free to improve and optimize the script to make it better.